(UPDATE: On a 6-to-0 vote, the Stockton City Council on Thursday (Oct. 3) approved a “plan of adjustment” to cut debt and exit bankruptcy. City Manager Bob Deis told the council an agreement with the largest bond insurer, Assured Guaranty, came at 9 p.m. Wednesday. The city is still negotiating with Franklin over $35 million in bonds backed by two golf courses and an ice rink, which would be of restricted use if taken over by Franklin. Chances of the Stockton bankruptcy producing a landmark ruling to cut pensions dimmed last week, when the city announced a deal with one bond insurer and a tentative deal with another one. The two big bond insurers, who unsuccessfully opposed Stockton’s eligibility for bankruptcy, argued that a city plan to cut bond debt was unfair because the largest creditor, CalPERS, would be untouched. U.S. Bankruptcy Judge Christopher Klein said the proper time to rule on the CalPERS question is when the court considers whether all creditors are being treated fairly by the city “plan of adjustment” to cut debt and emerge from bankruptcy. Now Stockton may be taking big steps toward resolving the fairness issue by negotiating a plan with creditors to exit bankruptcy as urged by the judge. Klein brought in another bankruptcy judge, Elizabeth Perris, to conduct mediation. A debt-cutting plan proposed by Stockton last week cited a tentative agreement with National Public Finance Guarantee, backer of $89 million in bonds, and a draft agreement awaiting approval by Assured Guarantee, backing $164 million in bonds. The Stockton city manager, Bob Deis, said the city has agreements with 14 of 19 major creditors. He said a “cram down” approach, which imposes debt cuts opposed by creditors, will not occur until a court order is obtained. Deis said the proposed plan of adjustment, scheduled for a City Council vote Thursday, is the first step in a complicated process that could, in six months, get Stockton out of the bankruptcy declared June 28 last year. The Stockton bankruptcy has been widely watched because of speculation that public pensions, protected against cuts by state court decisions based on contract law, might be reduced in federal bankruptcy court like other contract debt. If the city negotiates agreements that avoid a ruling on whether pensions can be cut, the Stockton bankruptcy still may have produced an important ruling on a growing retirement cost: retiree health care promised state and local government workers. Retiree health care often has a long-term debt or “unfunded liability” similar to pensions. But most employers do not make annual pension-like contributions to a retiree health fund, which can yield investment earnings to help pay future costs. The view that retiree health care is a benefit that can be cut may change. This month a superior court overturned a freeze on retiree health care for Los Angeles city attorneys, citing the same contract case law that protects public pensions. The new Los Angeles ruling, though limited and likely to be appealed, is already having an impact. “Court ruling on retiree health benefits credit negative for Los Angeles, could impact other California municipalities,” said a headline in a Wall Street credit rating agency newsletter last week, Moody’s Weekly Credit Outlook for Sept. 26. If it turns out that state law does indeed give promised retiree health care the same protection as pensions, a ruling in the Stockton bankruptcy could be important as desperate cities look at the option of bankruptcy. Judge Klein, in a deeply researched 40-page ruling last year, refused to temporarily block Stockton’s elimination of retiree health care while the city pursued eligibility for bankruptcy (granted in April) and a debt-reduction plan to exit bankruptcy. A Stockton retiree group argued that their promised retiree health care is a vested right under federal and state contract law. Under federal law, Klein said, a bankruptcy court cannot “interfere with” the property or revenue of a debtor. In other words, the bankruptcy court cannot tell the debtor how to spend its money. So Klein said he could not block the cut that “may lead to tragic hardships for individuals in the interval before their claims are redressed” in a plan of adjustment. The elimination of retiree health care for current workers and retirees is one of the major savings in the proposed Stockton plan of adjustment released last week. Stockton has said since filing for bankruptcy that it does not want to cut CalPERS debt, arguing that pensions must be protected to keep the crime-ridden city competitive in the job marketplace, particularly for police. Last June the city announced an agreement with a retiree group for a $5.1 million retiree health care lump sum payment for an estimated 1,100 retiree claims, up from an original proposal that would have given them nothing. The proposed plan said Stockton has two groups of retirees, divided by a big increase in benefits adopted by many local governments after a CalPERS-sponsored bill, SB 400 in 1999, gave state workers a large, trendsetting retroactive pension increase. Workers who retired before Stockton gave employees a benefit increase early last decade have an average pension of $24,000 and no retiree health care. Since the increase, the average pension is $51,000 (most get no Social Security) with a medical benefit worth $26,000 a year. Stockton has negotiated agreements with all of its labor unions. The plan estimated that the loss of retiree health care, pension reforms and pay cuts reduces the total retirement benefit for current workers by 30 percent to 50 percent or more. Current employees will pay the full employee share of the contribution to the California Public Employees Retirement System, 7 to 9 percent of pay. New employees get a lower pension under a state reform. If Stockton can cut a deal with the bond insurers, the judge may not have to determine whether the bond insurers are treated unfairly because the cuts for Stockton retirees are not deep enough. A tough opening position by Stockton has softened in negotiations. The new plan said that under a deal in February, Ambac, backer of $12 million in bonds, gets revenue from property tax growth and will not get a “haircut” if assessed values grow as expected. National Public gets revenue from property tax growth that should “fully service” a restructured deal on $45 million in arena bonds. New parking revenue is expected to cover a deal on $32 million in bonds for three garages, repossessed by National Public. The draft deal with Assured for $124 million in unsecured pension bonds and $40 million in bonds for a city hall building, repossessed by Assured, await approval by Assured executives and were not revealed. This entry was posted on September 30, 2013 at 7:25 am and is filed under Bankruptcy, Retiree health, Stockton. You can follow any responses to this entry through the RSS 2.0 feed. You can skip to the end and leave a response. Pinging is currently not allowed. How are we (the Taxpayers) ever to get “relief” if the future service pension and benefit accruals of ALL Public Sector workers are not reduced. While I understand the Stockton Council’s “competitiveness” concern, SOMEONE has to be “first” in bringing these pensions & benefits down. Surely others will follow quite rapidly and the “competitiveness” issue with dissipate..
Public Sector employees did not bankrupt Stockton. The inept city council and an inflated housing market manipulated by large banks did. Your statement perpetuates a race to the bottom for all working class people. I have tried to tell you before TL, but you won’t believe me: It comes out of your taxes. No matter what happens, you are not going to see your taxes lowered. Why not just decided to enjoy the fact that you have the good fortune to be living in the best country on earth, and you can get away with saying the things you say. SeeSaw, whether you are the 74 year old modestly paid Public Sector retiree (or a paid Union mouthpiece) it matters little. I don’t expect taxes to decline. The goal is to keep them from RISING to paid the grossly excessive Pension & Benefit promises that have been made to ALL Public Sector workers … everywhere. CalPERS has already announced a 50% increase in required contributions from member cities, which will undoubtedly be reflected in INCREASED future taxes. Taxpayers should simply band together and refuse to pay for these underhanded Union/Politician deals. According to this Forbes article: “These state courts hold that state retirement statutes create contracts as of the first day of employment, so that the state cannot reduce pension benefits (or increase workers’ contributions) for any of its current employees, even if the changes are entirely prospective. If the California Constitution says that retroactive benefits are illegal, and our judges have ignored the law by allowing such, how is it that our so called “judges” can claim the state cannot reduce pension benefits (or increase workers’ contributions) for any of its current employees even if the changes are entirely prospective? How can “our judges” ignore the constitution regarding retroactive benefits while taking a hard-line on lowering future pension benefits, or even health care benefits? It doesn’t make sense and the decisions are at the very least hypocritical. Not often talked about, healthcare benefits and reduced retirement ages also represent retroactive benefits. The reduced retirement age increases the pension cost immediately, and therefore the unfunded pension liability. The reduced retirement age (from 60 to 55, or 55 to 50) also provides a retroactive benefit in the form of five extra years of health care benefits. When you add those costs together – and those benefits were never promised to most employees that claim they were promised these benefits, the cost adds up quickly. It begs the question, do our judges have a conflict of interest? I think the answer is yes. 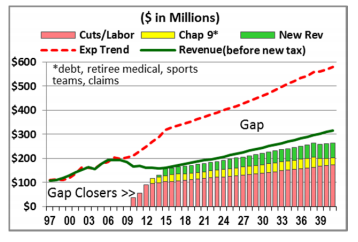 Seesaw, I guess david Lowe has spoken through his Calpension mouth piece. Thanks for the heads up! Paid union mouthpiece? Ha, Ha, Ha. That’s how little you know about public employees. The only union mouthpiece I ever saw was the one that attended our meeting once a year to let us know what had been agreed to, in the CB process. . And nothing was ever mentioned about the politicians. You’re just another tea-partier! You don’t care about the law or the rules; you just think you can stomp your feet and refuse to pay–well, you can’t. This is a nation of laws, TL, and being a tax dodger has consequences! Anyway, its 77..
Come off it, Captain! I am not in David Low’s union and as I have told you multiple times before, I have never met David Low! In case you don’t know, Captain, Chapman U is a private, politically conservative institution. Of course it is going to come down on the side of the extremists, on the right! @Captain: When the state made a retroactive pension improvement in 1999 it was not extra compensation for work already done. The rationale was that CalPERS was over 100% funded and increasing benefits was seen as a way of distributing the excess investment returns back to the CalPERS members. (2) with CalPERS insistence of a one-way ratchet …. that pensions can go up, but NEVER down … any over-funding (surely up to a legitimate 125% funding ratio) should have remained in the fund to protect against downside risk …. which, with the benefit of hindsight, we know is EXACTLY what happened. (2) ALL of the workers actual contributions throughout their careers (INCLUDING the investment income earned on those contributions) RARELY accumulates to a sum at retirement sufficient to buy more than 10-20% of the VERY generous pensions they have been promised, Taxpayer contributions (and the investment earnings thereon) are responsible for the 80-90% balance. Hence even IF over-funding existed, 80-90% of that excess should have been returned to it’s source, the Taxpayers, with only 10-20% of it going back to the workers. Well, TL, you can’t exclude the workers from the taxpayers’ category–they are part of it. An insurance company could not stay afloat if it did not collect more in premiums than it pays out in benefits–the same principle works with CalPERS. That’s life–take it or leave it– or leave the country. You have choices, and don’t forget–envy has consequences. SeeSaw, This is what the future of many cities in CA will look like over the next few years …… all due the the VERY greedy Public Sector Unions and workers. I’ve already read the article, TL. I’m no investment expert, actuary, or analyst. I do know that payments to CalPERS are a percentage of payroll, and a, respective entity’s, liability is, in most cases, a smaller percentage of its total budget, than are its other liabilities.. There are obvious factors involved in a, respective, public entity’s downfall, that preceded the pension problems. I will continue to l maintain, until a Court rules differently, that CalPERS is an arm of the State, and each member entity is a part of that arm, and, therefore, CalPERS is not a creditor of any, respective, entity that is involved in bankruptcy. You really should stop the bad-mouthing of public sector workers–the ones who work to provide the citizens the services they need to have quality lives–something I think should be important to most. You have no real facts for the snarky comments you make about those workers–just your opinions, which have nothing to do with the real facts..
CalPERS is more like the ARMPIT of the State. Shame on you, TL. Such offensive, insulting rhetoric is entirely unnecessary! This is serious business, and the lives of many people are affected, in some way or another, by these issues. SeeSaw, You bet it’s serious business. That’s why I strongly advocate for VERY material pension reforms (50+% reduction in the pension accrual rate for all CURRENT Public Sector workers), so that PRIVATE Sector Taxpayers might also have a shot at a reasonable retirement. What you advocate toward middle class and poor workers is draconian and cruel, TL! Any such action would have nothing to do with the private sector, where pensions are concerned. Taking care of those workers is the responsibility of private industry. More money placed in the hands of the Corporations would just go into the bank accounts of the CEO’s. that you find “draconian” ? The above are (in my opinion) reasonable and appropriate goals. The fact that material reductions in the current grossly excessive Public Sector pensions is necessary to get there, is simply righting a long-perpetuated wrong. You can have my pension if you give me that EQUAL total compensation for my private sector co-professionals. Of course I will expect you to cough up to me the $300000~400000 in salary I have missed out on; plus interest of course. Also I will expect to be refunded on the health insurance premiums I didn’t have to pay before leaving the private sector as well as the additional out of pocket costs I have incurred since my current health plan was downgraded. Naturally I would expect to pay the employee’s share of the Social Security deductions during that same period, though my employer must also pay their portion. Oh and don’t let me forget the matching 401(k) in line with my current deferred comp. deductions. I hope this is merely an attempt to engage/enrage me. If this is a serious argument – one of the most ridiculous arguments I’ve read in some time, please let me know and I’ll be happy to respond. COS_employee, Sure sure, you like many (IT professionals) believe firms like APPLE,Google, Facebook, etc., would be banking down the doors to hire you should the opportunity arise. Earth to COA_ such firm seek out entrepreneurial risk-takers who are often so passionate about their work, the all-nighters are consider “fun”. Public Sector workers with their Cradle-to-grave security desires, 40- hour workweeks, and OT for a minute longer are hardly the type of employee Apple, Google, or Facebook has on their radar screen. You have obviously never known real public sector workers, TL. When I went to work for a public entity, it was to help keep my family stable, financially. I started as a part-timer at the incredible rate of $1.85/hr., higher than the minimum wage at that time. The word, “pension”, was unknown to me. Well, in fact, there was no CalPERS, or SS at my workplace when I started in 1968. I never received OT and I put in thousands if unpaid hours over my 40-year tenure, just to make sure the public would get served properly.. I suggest you turn your ire toward those who are actually criminals in our society–not public workers..
Dude…..I’m NOT in IT and I’m talking about positions I turned down to come work for my city. I’m not a lifetime government employee; I’ve spent most of my career in the private sector. You attempts to slander public employees don’t resemble me or any of my co-workers. RSpringbok, When CalPERS said that, they were talking about PROSPECTIVE earnings …which of course turned out to be wrong by a mile … not a huge surplus from PAST earnings. COS, While you may be the rather rare Public Sector workers that is earns less in cash pay than your Private Sector counterparts, impartial studies (including those of the US Gov’t BLS) say otherwise, and with EQUAL cash pay in the vast majority of occupations, there is simply ZERO justification for ANY greater pensions or better benefits (as is the situation today). Hopefully , Taxpayers will demand and succeed in changing that for not only new workers, but for the FUTURE service of CURRENT workers. TL, you’re like the guy that keeps repeating the same procedure over and over and expecting to get different results. You can keep saying that the future service of current workers needs to be changed–say it in your dreams if you want–its never going to happen. The public workers are taxpayers in CA and they have lots of family members, and friends. And, to look back on the words of then Governor Arnold Swartzeneggar in his final State of the State, address: “It would be both illegal and immoral”. SeeSaw, I feel VERY confident that in MANY Plans the pensions that will accrue for service in future years will be lower for current workers than they accrue today. In the not too distant future, even the Unions will see that it’s a better choice (accepting less) than losing it all. Just keep feeling very confident, TL.